In “Innovative Docker Log Management” we wrote about the alternative (and better?) method for Docker logging compared to log drivers, which do only log forwarding. 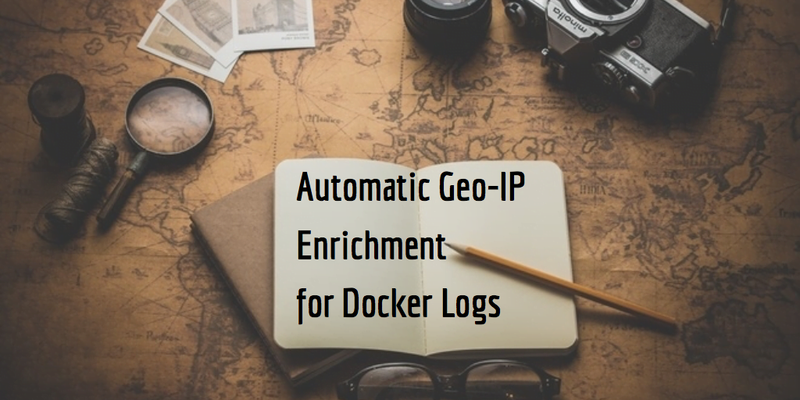 Getting logs from Docker Containers collected, shipped and parsed out of the box is already a big time saver, but some application logs need additional enrichment with information from other data sources. A common use case is to enrich web server logs (or really any logs with IP addresses) with geographical information derived from those IP addresses. Over the last few weeks, we’ve added Geo-IP support to logagent-js (blog post), which is used by the Sematext Docker Agent. Use Sematext Docker Agent for out of the box Geo-IP support! geoIP: fieldName in the pattern. See for example the web server patterns here. The example above needs no configuration for web server logs or the Geo-IP lookups! It’s never been this simple to get a web server setup including web analytics and performance metrics: One command to run a web server and another one to get structured logs, metrics and events! We think such an easy setup is a good reason to run web servers on Docker, Docker-Swarm or Docker Cloud! Do you need support for Geo-IP in other applications running on Docker? Please let us know and get in touch with on Twitter @sematext or via Github for feature requests. If you like what what you have seen here give SPM for Docker and Logsene a go! Replace LOGSENE_TOKEN with your Logsene token. Great post! and great service! please, can you share the kibana dashboard? some repo?